With the international release of their 2017 album French for Rabbits ‘The Weight of Melted Snow’ due out January 19th, French for Rabbits’ new track “Highest Hill” is a sweetly atmospheric journey of highs and lows emphasising their dream pop repertoire. Relationships, particularly new relationships, are often depicted as adventurous, taking emotions on extreme journeys and causing the heart to flutter as though racing with adrenaline. They can lead you to unexpected places, seemingly open the eyes to new wonders and then, maybe, put your happiness in danger and send you tumbling down a rocky path. 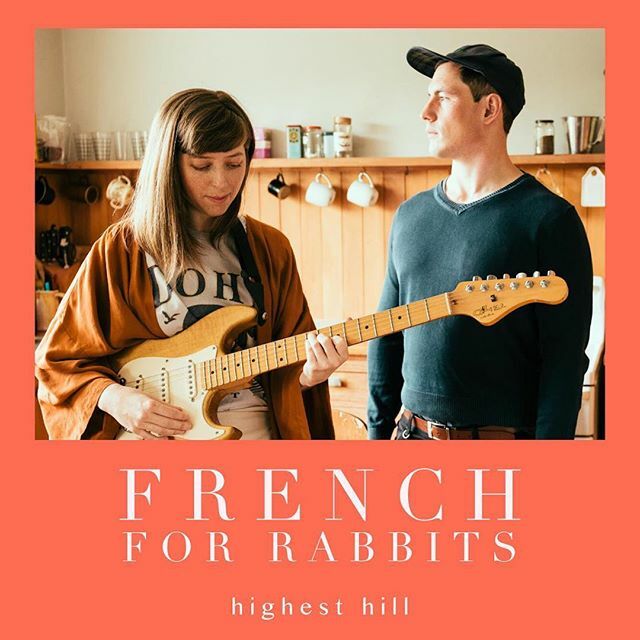 French For Rabbits, the New Zealand band led by Brooke Singer and John Fitzgerald, sound delicate and ethereal with Singer’s vocals trailing in a whisper — but their newest track, “Highest Hill” (released November 27), has a harshness cutting through the smooth surface. This juxtaposition present in the lyrics is a reflection of common conflicting emotions, the way one can want to love and hurt somebody both at the same time. French For Rabbits entered the music scene in 2012, their songs, wistful and relaxed, blending into one another in that distinctly ambience centred dream-pop way. It’s a sound that continued into their second album, The Weight of Melted Snow, which was released in New Zealand last year. 2019 will commence with an international release of this album through Muscle Beach Records, and “Highest Hill” is a new addition to the tracklisting. Musically, “Highest Hill” begins with a rippling pop riff, calm but tense as though indicating a build up. The pace progresses slightly, there’s a drumroll into the chorus and then the listener is lifted up into the sky, floating absentmindedly as the senses are controlled. All the while, Singer’s vocals maintain their softness, wispy and innocent like the whitest of clouds. The Weight of Melted Snow was partially derived from a breakup and “Highest Hill” is a poignant way of reintroducing the album to New Zealand and the rest of the world. Since its initial release in 2017, French For Rabbits have toured Europe and opened for Lorde in their home country. 2019 will see the band taking to the U.S for the first time as well as immersing themselves in the SXSW experience. Whether feeling in high in spirits or lower than you’ve ever felt, French for Rabbits have a way for taking you out of your body and causing you to reflect. Sweetly atmospheric, everything is suddenly glossed over with a sanguine haziness so that even the cruelest of actions can feel pleasantly reassuring.